Change things up with a short trip to La Aurora Zoo in Guatemala City (about 58 minutes away). And it doesn't end there: contemplate the geological forces at Volcán Pacaya, explore the ancient world of Arco de Santa Catalina, don't miss a visit to Cerro de la Cruz, and take in the architecture and atmosphere at Iglesia de La Merced. To see maps, photos, where to stay, and other tourist information, you can read our Antigua vacation planner. Reykjavik, Iceland to Antigua is an approximately 18-hour combination of flight and shuttle. You can also do a combination of flight, car, and shuttle. The time zone difference when traveling from Reykjavik to Antigua is minus 6 hours. Traveling from Reykjavik in September, expect nights in Antigua to be somewhat warmer, around 19°C, while days are much hotter, around 28°C. Wrap up your sightseeing on the 23rd (Sun) early enough to travel to Santa Cruz La Laguna. Start off your visit on the 24th (Mon): stop by Manos Crucenas Artisan Store and then explore the activities along Lake Atitlan. To find traveler tips, maps, other places to visit, and tourist information, you can read our Santa Cruz La Laguna trip planner . You can do a combination of bus and taxi from Antigua to Santa Cruz La Laguna in 2 hours. Alternatively, you can drive. Expect a daytime high around 29°C in September, and nighttime lows around 17°C. Finish your sightseeing early on the 24th (Mon) to allow enough time to drive to Quetzaltenango. Named for the Quetzal bird--one of Guatemala's national symbols--Quetzaltenango once included the territories controlled by K'iche' Mayans, a pre-Columbian tribe eventually supplanted by Spanish conquistadores. Start off your visit on the 25th (Tue): don't miss a visit to Central Plaza, look for gifts at Yabal Handicrafts, and then contemplate the geological forces at Santa Maria Volcano. To find ratings, more things to do, and more tourist information, go to the Quetzaltenango day trip planner . You can drive from Santa Cruz La Laguna to Quetzaltenango in 1.5 hours. Alternatively, you can do a combination of taxi and shuttle. Prepare for slightly colder weather when traveling from Santa Cruz La Laguna in September: high temperatures in Quetzaltenango hover around 24°C and lows are around 13°C. Finish your sightseeing early on the 25th (Tue) to allow enough time to drive to Lanquin. San Agustín Lanquín, often referred to simply as Lanquín, is a municipality in the Guatemalan department of Alta Verapaz. 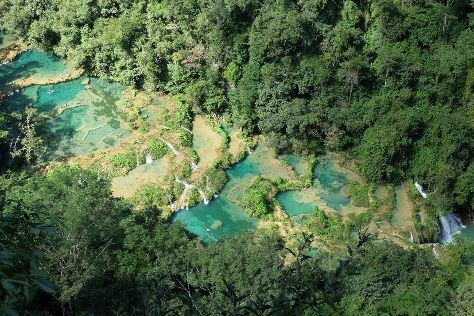 Start off your visit on the 26th (Wed): get outside with Aventura Grande and then admire the sheer force of Monumento Natural Semuc Champey. To see where to stay, traveler tips, photos, and other tourist information, read our Lanquin holiday builder . You can drive from Quetzaltenango to Lanquin in 6 hours. Other options are to take a bus; or do a combination of bus and shuttle. Plan for much hotter temperatures traveling from Quetzaltenango in September, with highs in Lanquin at 39°C and lows at 28°C. Finish your sightseeing early on the 26th (Wed) to allow enough time to drive to Tikal National Park. Start off your visit on the 27th (Thu): explore the wealth of natural beauty at Tikal. For ratings, photos, more things to do, and tourist information, you can read our Tikal National Park trip itinerary builder website . Traveling by car from Lanquin to Tikal National Park takes 8 hours. Alternatively, you can do a combination of shuttle and bus; or do a combination of taxi and bus. Finish up your sightseeing early on the 27th (Thu) so you can go by car to Peten. Start off your visit on the 28th (Fri): don't miss a visit to Isla Principal Topoxte, then take in the architecture and atmosphere at Catedral de Flores, and then explore the ancient world of Yaxha National Park. On your second day here, identify plant and animal life at Ixpanpajul Nature Park. You can plan Peten trip in no time by asking Inspirock to help create your itinerary. Traveling by car from Tikal National Park to Peten takes 2 hours. Alternatively, you can do a combination of shuttle and taxi; or do a combination of bus and taxi. On the 29th (Sat), wrap the sightseeing up by early afternoon so you can travel back home.